Given that many drivers around here consider beaches just especially sandy stretches of road, color is not only a smart fashion choice; it’s a survival strategy. So as you strip down to that backless one-piece, we suggest you dial up the accessories for maximum visibility. Trade in those dainty earbuds for some legit headphones, jazz up your patch of sand with a busy towel, and salute the sun with a bright orange orb of a hat. Towel by Fresco ($158) and necklaces by Chan Luu ($195), Sam and Lilli. 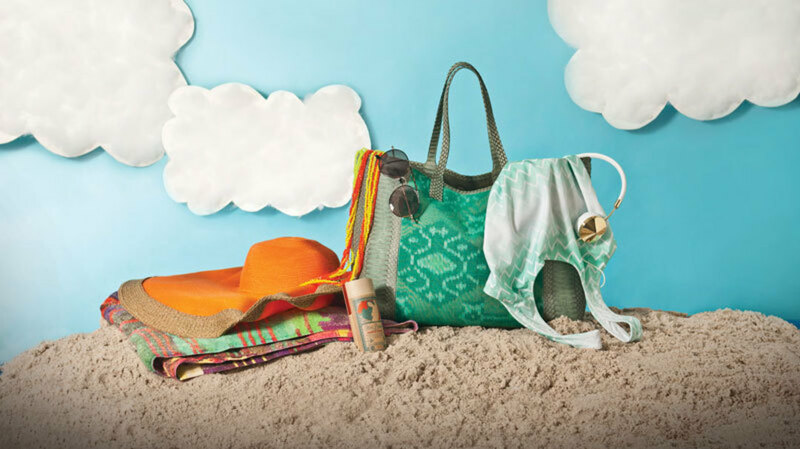 Kokin hat ($395) and Beirn tote ($495), Tootsies. Hair powder by Lulu Organics ($30) and backless Kovey one-piece ($144), Myth & Symbol. Tom Ford sunglasses ($500), Abejas Boutique. Frends headphones ($149.99), Nordstrom.